The much anticipated Blackberry Bold Touch 9930 has only been experienced by leaked photos. That is, up until now! (thanks to the folks at N4BB). 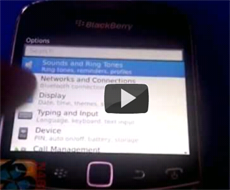 New leaked video from shows the “never before handled on video” Blackberry Touch 9930 which is the CDMA version of the Bold Touch. The new device will likely hit Verizon and Sprint and is set to release sometime next month.